Communion Tokens: A Guide for Collecting Scottish, Canadian & United States Tokens. Author: Michael S. Shutty, Jr. If you are interested in Communion Tokens, you are not alone. However, it sure seemed that way when I started collecting them a few years ago. I found that most of the references are decades old except for the encyclopedic listing of communion tokens published by Lester Burzinski in 1999. Unfortunately, his tome is hard to come by, as only 250 copies were printed. Furthermore, there were no introductory guidebooks that provided an overview of the series to help collectors get started. Consequently, I decided to take on this challenge. The result is this book and a blog that I started on blogspot. Communion tokens come in all sizes and shapes. There are over 7000 of them worldwide, but most come from Scotland where the Presbyterian Church became the established church of the land. 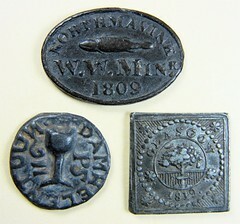 Canadian tokens are also popular, whereas the American tokens are rarely encountered. Most collectors gravitate towards the Scottish pieces, as the variety is entertaining. 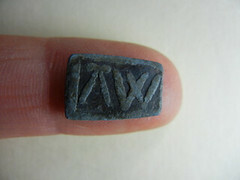 Communion tokens are old too; they are available from the mid-seventeenth century onward. Personally, I find the old ones inescapably charming, as many of them are molded from handcrafted dies. The tokens were part of the Presbyterian fabric until the first quarter of the twentieth century. They were passed out to selected parishioners prior to the communion service to allow admittance to the Lord’s Table. The minister, assisted by the church elders, examined all those requesting tokens to insure their probity. As such, it was an honor to receive a token and a disgrace to be refused one. There are interesting stories about how some folks bartered to gain a token, and how others were called out by ever vigilant neighbors as they approached the table, only to have their token taken away for being a witch, thief or fornicator. Certainly, these were interesting times. 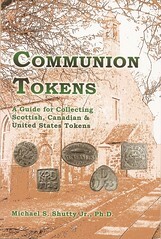 Communion Tokens: A Guide to Collecting Scottish, Canadian & United States Tokens is available on the Wasteland Press website: Books123.org. For more information about the book or the tokens, check out the blog at communiontokens.blogspot.com . The Numismatic Bibliomania Society is a non-profit organization promoting numismatic literature. See our web site at coinbooks.org.